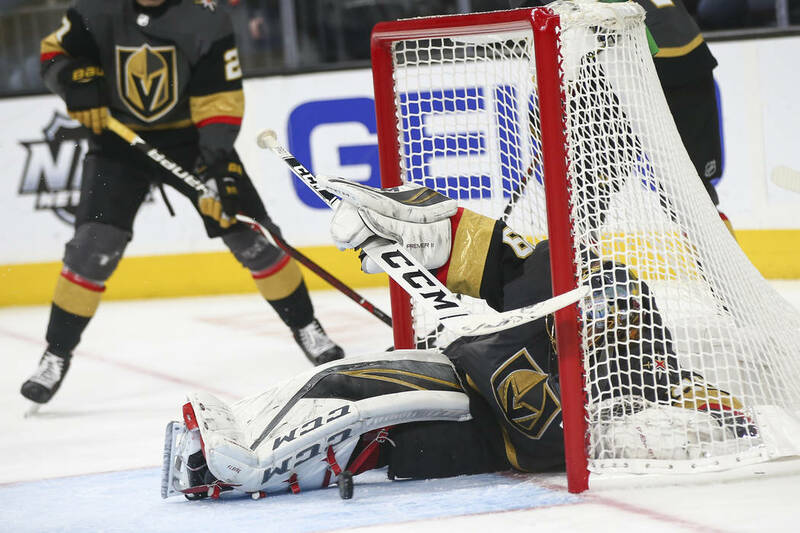 Golden Knights coach Gerard Gallant was clearly agitated with his team after it suffered a franchise record-tying fourth consecutive home loss on Tuesday night. He appeared even more displeased when he was informed his players had acknowledged his postgame tirade to reporters. Gallant’s angst is understandable. The Knights have dropped six out of their last eight games and have daunting matchups with Toronto and Nashville, starting with the Maple Leafs visiting T-Mobile Arena at 7 p.m. Thursday. On the positive side, the Knights look poised to claim a playoff berth as they sit nine points ahead of fourth-place Vancouver for the last guaranteed spot in the Pacific Division entering play Wednesday night. But they will have to start cleaning things up if they want to challenge for the Stanley Cup again. 1. Find some ‘jam’ to their game. The Knights are at their best when they are aggressive on the forecheck and not allowing teams to get comfortable moving the puck back up the ice. Will Carrier and Ryan Reaves are first and second in the league in hits, but it takes a full team effort and several players mentioned after Tuesday’s game and Wednesday’s practice that there’s just not enough players fighting for every inch of the ice. Nate Schmidt called out the team for needing to find more ‘jam.’ Max Pacioretty feels that requires a group mindset and believes the message has been received. 2. Address the third period issues. The Knights were outscored 13-3 in the third period over their last eight games, including 3-0 in Tuesday’s 5-2 loss to Arizona. Despite the slide, the Knights are still outscoring opponents 56-51 in the third period. Goaltender Marc-Andre Fleury lamented after Tuesday’s loss that the team has struggled to retain that identity. “I feel like that third period used to be our strong one where we finish teams. It’s not happening now, and maybe we have to play well defensively — myself included — to give us a chance to stay in the game.” If Fleury (and other veteran members of the defensive core) are feeling fatigued, this may be the area it is showing up. The 34-year-old has played 50 games already this season, three more than any other goalie in the league. The Knights are in a fairly unique situation in terms of the standings right now. As most teams fight and scrap for playoff spots, they sit firmly in the third and final automatic spot in the Pacific Division. The Knights are eight points behind Calgary for second place in the division and nine points back of San Jose. They are also nine points clear of Vancouver, so there isn’t a whole lot of pressure being applied in either direction at the moment. The Knights started this eight-game stretch with back-to-back losses against Minnesota and Nashville in which they outshot their opponents by a combined 80-49 and were outscored 6-3. The Knights still have very good numbers on the penalty kill, ranking sixth in the league in that category at 83.1 percent. They have surrendered a power play goal in four straight games, however, while only scoring once on their own power plays in the last five contests. Perhaps even more troubling is the disparity in penalties. Vegas has allowed 14 power play opportunities in the last four games while getting the man-advantage just seven times.